1. Last date of Application: May 27th, 2019. 2. Date of Examination: June 2nd, 2019. 3. Result of Examination : June 5th, 2019. 4. Interview Date : June 8th, 2019. 5. Result of Interview : June 8th, 2019. 6. Last Date of Depositing Registration fee : June 13th, 2019. ** As per syllabus (wherever applicable) of UGC NET/ GATE/GPAT/ICAR / Master level course. The application form can be downloaded from here or the applicant can buy the prospectus 2019 from the university campus after paying cash at accounts department. 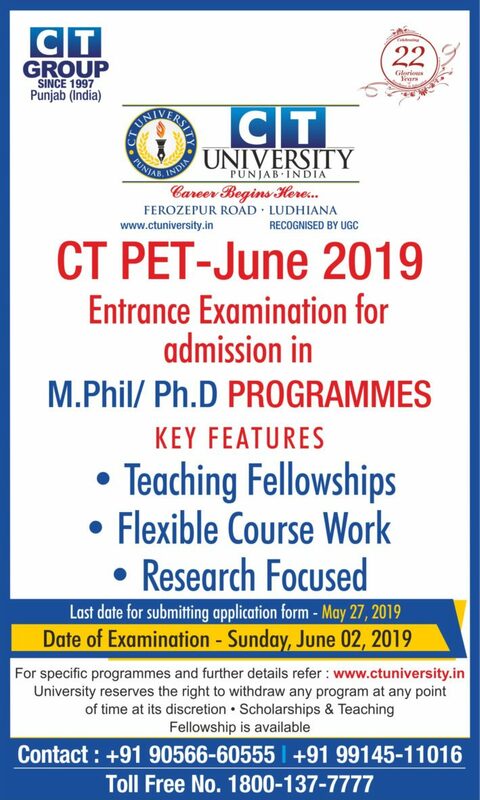 The application fee (Non Refundable) for CTPET June 2019 is Rs. 1000/ (one thousand only). Bank and Branch Name: HDFC Bank Ltd, Mullanpur Dakha, Ludhiana. Ferozepur Road, Sidhwan Khurd, Ludhiana-142024. Scanned copy of the duly filled form along with the fee payment receipt (Snapshot of payment made) can also be mailed to ctpet@ctuniversity.in and the applicant should mention the program name in the mail subject e.g. PhD English and also before scanning the application form applicant should mention the transaction ID on the application form. Applicants will be required to submit the original filled form along with the fee payment receipt before appearing for the entrance exam at the examination centre. Applicant should mention the valid mail id and mobile number as all future communication including the issue of hall ticket will be through email only. All candidates admitted in Ph.D full time programs are eligible for teaching assistantship after successfully completing their course work. Note: Number of teaching assistantship is subject to the availability of seats within concerned department/school.